For many of us the relationships that we have with our siblings hasn't changed a whole lot from when we were children. Family relationships and the way that siblings interact can be so strongly established in childhood that even as the individuals involved grow and change, they continue to view one another as they were years before. Sometimes, birth order can have a great impact on one's role in the family as well as contributing to the characteristics of the person in their dealings with the outside world. Alfred Adler, noted psychiatrist, is quoted as saying, "...Individual psychology has very clearly pointed out that everyone who is deeply unhappy, the neurotic and the desolate person stem from among those who were deprived in their younger years of being able to develop the feeling of community, the courage, the optimism, and the self-confidence that comes directly from the sense of belonging...out of this emerges a lasting, genuine feeling of worthiness." The most fundamental aspect of Adler's theories is that a person's sense of themselves as a member of a community is a gauge to their happiness and mental health. He further spoke of birth order and the characteristics commonly associated with personality based on the place in the family (the first community), acknowledging that other factors, such as socio-economic status and parental attitudes can alter these roles, making them guidelines, rather than set-in-stone finalities. Oldest Child: May have a tendency to be authoritarian and unyielding. Since first children are often asked to take some responsibility for the care of younger siblings, they may act as though they have a right to tell the others what to do. Second Child: A second-born often feels a sense of competition with the older sibling, resulting in a sometimes tumultuous relationship. Unless parents encourage the accomplishments of both children, a life-long rivalry may be established. 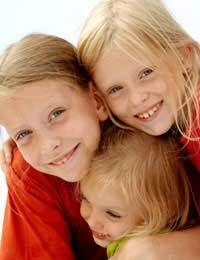 Middle Child: Middle born children are the most likely to feel "invisible" or insignificant, even as adults. The feeling that they are somehow not as accomplished as their older sibling or as special as their younger one may lead them to a sense of resentment. Youngest Child: Youngest children may be a bit spoiled and can have a hard time letting go of the notion that other people will do things for them. As they mature into adulthood, youngest siblings may feel either a need to "do something big" to prove themselves or may rail against what they see as interference by older siblings. Twin: Unless parents are careful to acknowledge twins (and other multiples) as individuals, they may have a hard time establishing a sense of individual identity. Typically, one twin is stronger than the other, taking on a leadership role with the sibling who shares their birthday. Some factors that affect sibling relationships cannot be changed, such as birth order, but there are steps that parents can take to encourage their children to develop positive and healthy relationships with one another. Making a conscious effort to recognise and celebrate the individual strengths of children goes a long way toward helping them to feel loved and decreases the need for competition. Additionally, encouraging each child to interact with their siblings, both as a group and two-by-two, increases the likelihood that they will develop bonds that can turn into lifelong friendships. While sibling relationships may be complicated, they are often some of our most valued, as well. I am heading to court soon to try and keep our children together (12 & 5 almost 6 both girls). The mother does not want them to be together as she says that they are to far apart in age. The eldest child come to live with us when she was almost 11 as she did not like her mums new boyfriend. Being that they had only known each other for 2 months and he moved in. The problem I have is that they also don't live close to each other and only see each other on weekends and holidays. I have remarried with my partner having a 9 year old boy. All the kids get on well (98 % of the time)and you would think that they are from the same family. The family report writter has said that the age difference is of concern and seperating the youngest from her mother would be detrimental as she has never lived with anyone else. Reading as much as I can on all the theories etc I am a little confused to the direction I should take with the care and attention the girls need.